The advancement of warfare from mid Sixteenth Century to the end of the Napoleonic Period. Established during the winter of 1644-5 to bring efficiency and professionalism to Parliament's war effort, England's New Model Army initially consisted of 7,600 cavalry, including one regiment of dragoons, and 14,400 infantry. The execution of Charles I in 1649 ushered in eleven years of republican rule during which the New Model, a standing force, was the fount of political authority. 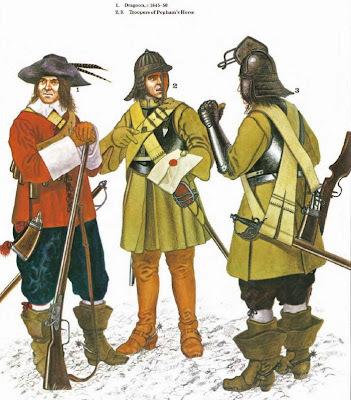 By July 1652 the Commonwealth government had over 70,000 men in arms in England, Scotland and Ireland, reducing to 53,000 in 1654, 42,000 in 1658, and 28,342 in 1660. The basic unit of cavalry was the troop, averaging some 60 troopers but rising occasionally to as many as 80. Generally there were six troops in a regiment, but instances of eight were not uncommon. Cromwell's own regiment of horse, dubbed 'The Ironsides', was a double-strength regiment of 14 troops, and upon the formation of the New Model provided enough men for the entire regiments of Fairfax and Whalley, with a cadre left over to form a basis for other units. Once the New Model cavalry became organized the regimental strength settled down at six troops of 100 men each. The colonel and the sergeant-major each commanded a troop, the remaining four being led by captains. Troop officers were a lieutenant, a cornet and a quarter-master. The colonel's troop was frequently led by the senior lieutenant of the regiment since, as in the infantry, the colonel was often a general officer, absent on other duties. The cavalry are one instance in the New Model of strengths being up to establishment, and sometimes even over the required figure. In the force Cromwell led to Ireland in July 1649 he had an overstrength regiment of horse of 14 troops under his personal command. This was subsequently split in two, and Cromwell's major, Thomas Shelloourne, was given command of the second regiment. The cavalry helmet was the reliable zischagge, or 'lobster-tail pot'. Basically this had a round skull with attached front peak, neck-guard and earguards. Neck-guards were often of true or simulated 'lames', that is, narrow horizontal strips rivetted along the edges-thus the 'lobster-tail'. Some styles featured a face-guard of one or three ban; dropping vertically from the peak, while others had none. There was no standard pattern, and since English-made and imported Continental helmets were both used in great numbers it is pointless to seek one. The coat of 'buff’ - 'buffalo' leather by old tradition, but in fact of cow hide-was the basic garment of the cavalryman throughout the Civil Wars and afterwards, being worn with or without the additional protection of a metal back-and-breast cuirass. Buffcoats were expensive-roughly the same price as a horse-so Parliament was doubtless glad to be relieved of the burden of such an expense when forming the New Model horse: for most troopers would certainly have possessed them already. The use of armour in the cavalry, as in the infantry, was on the decline; it is likely that the cumbersome metal back-and-breasts would have disappeared gradually during the period under consideration, although the helmet was retained. There is little or no evidence that the cavalry adopted any red uniform items in parallel with infantry practice, but here we are forced into pure speculation. Some buff coats had long sleeves, often with double upper sleeves; others did not protect the arm, or had long sleeves buttoning up their whole length which were often worn open and thrown back from the shoulder, exposing the doublet. Contemporary engravings show, in some cases, what arc clearly decorated sleeves, with braid in vertical and horizontal bands. This suggests that the sleeves arc those of a cloth doublet exposed by a sleeveless buffcoat; and these sleeves were undoubtedly coloured. The degree to which the Venice red of the New Model foot was used must remain a mystery. Trousers, of sober colour and hard-wearing materials, would often be of a tighter fit than the baggy infantry style, since they had to be worn tucked into the riding boots-which were perhaps the trooper's most important garment after the buff coat. They were of thigh length, and when pulled fully up for riding gave considerable protection. The toes were generally square, in the fashion of the day, and the heels fairly high; massive spurs were normal, with large 'butterfly' guard-leathers at the instep. The 'bucket' tops of the boots could be folded down when dismounted, and are often shown worn in this way in contemporary pictures. Special over-stockings called 'boot hose' were normally worn under the boots to protect the finer hose worn next to the skin. Two thousand pairs of boots described as 'of good neats-leather, well tanned and waxed' were purchased for the Irish expedition.